Final borders on Checkers, Anyone? DONE! Finish Trellis Garden Top: I was able to find enough focus fabric scraps to cut half blocks to fill out the inner border and then used the "brack" for the final border. DONE! Put final border on Holiday Frost -- Umm, that's where I bogged down, though I still have two days to get it done before the end of the month. It's small, 32" x 36", but it could be nice for someone in a wheelchair or, with borders, a nice comfort quilt. But what really distracted me this weekend was reading about what others are doing with leftover bits and orphan blocks. Specifically, Cynthia Brunz (Quilting is More Fun Than Housework) has given an indepth look at her process, how she sorts by warm and cool colors, how she balances the different sizes of blocks, and how she uses odd bits and strips to fill in gaps. Well, I just HAD to pull out my "Parts Department" (first coined by Gwen Marston and Freddy Moran) to see if there was enough of anything to pull together. On top of the stack were a group of Strips and Curves blocks -- which just happen to be PURPLE! I also found twenty 4-patch posey blocks made from a set of panels, a large accumulation of miscellaneous blocks with black backgrounds, and a lot of modern 4-patches and HSTs. Some pieces, like the paper pieced palm fronds, go back to my earliest piecing attempts (and the seam allowances are proof). Surely I can find some way to use these miscellaneous pieces. I'll use February's Rainbow Scrap Challenge color to help me choose a starting point. Since I made major progress on my OMG, I am linking up with Patty at Elm Street Quilts. Apparently I AM passionate for purple because I've hardly made a dent in my purple scraps! But I've made a very good start with the Rainbow Scrap Challenge January color of purple. Let's see how I did. Inspired by other RSC participants, I decided to make scrap jar stars each month. I managed to get three made in January. At that rate, three 12" blocks x 10 months will make a very nice throw. I also chose another quilt in 101 Fabulous Rotary-Cut Quilts by Judy Hopkins and Nancy Martin that I think will help make a dent in my scraps. Here's the first block. I still have to put the borders on Zagnuts. I also finished Trellis Garden, part of my One Monthly Goals. I'm joining others reporting in with Angela at So Scrappy. In other words, if you hold on to a UFO long enough, it will become fashionable again. Such is the case with a pair of pastel floral monkey wrench quilts I began almost 10 years ago. 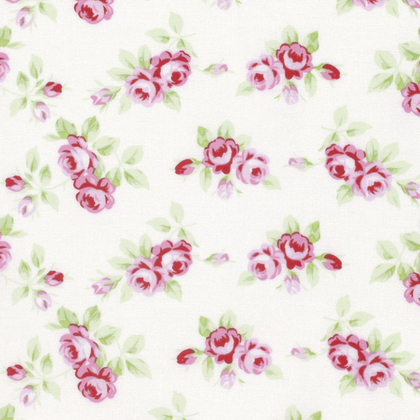 I really don't know what possessed me to collect pastel floral prints. Maybe at the time I thought it was what a "real" quilt should look like. But if you've followed my blog for any time you would know that I am NOT a floral pastel kinda gal. I have covered a pretty eclectic spectrum in my quilt projects; I don't think I've ever been stuck in a particular style of fabric at any point. If I've been guilty of anything, it's been periods of affinity for a particular color. I've been through my orange phase, my yellow phase, and my yellow-orange phase. And the gray phase which apparently I'm still in. But back to the pastel florals ... have you visited a shop lately or seen some of the new ads? Florals are back!!! I should be able to find something to go on the back now. Doing a happy dance for at least one finish this week and linking up with others at Confessions of a Fabric Addict. I started Trellis Garden last year when smokey purple was the Rainbow Scrap Challenge color of the month. I wrote about it HERE. I was eaking this one out of smallish pieces of yardage and had to get creative with the little brown squares. Plus I needed to calculate if I had enough of the darker purple and darker gold to extend those blocks into the border. Plus I had nothing lined up for the border fabric. So the project has languished in the box for several months. Now that purple is the RSC color this month, I figure it is time to finish this top. It doesn't show well in this photo, but I am using a third brown -- one I call "brack" because it's so brown it's almost black -- to fill the space. If I have enough I'll add a another row of the brack all around. Hop over to Patchwork Times to see what other quilters are working on this week. Two entirely different projects on my wall. Every time I stitched two purple rows together, it made room for another diagonal row of monkeys. The purple quilt (I'm calling Zagnuts) is now together except for borders. Ordinarily I would leave it borderless, but Covered in Love likes them a little bigger and that's where this one is going. I'll add the borders at the next Nuts and Bolts retreat in February where there will be plenty of room to lay it out and measure. Both of these quilts have used up a lot of miscellaneous scraps. I'm counting Zagnuts for January Rainbow Scrap Challenge along with several other blocks I'll be showing later on. It's hard to beat time spent with compatible friends, sewing and laughing and enjoying each other's company. Such was my week at our annual Rock Island quilting retreat. The cabins at Rock Island sleep 10, but we've found as we age that we like having our own bed! This was my year to be the Queen; that is, I got the "master suite" with one queen bed. Besides, it would be extremely difficult to get more than 5 machines set up to sew. The sofa gets crammed behind the stairway, and the chairs go into the bedrooms. We set up the ironing board in the queen room and use the kitchen bar top as our cutting station. What doesn't show in the photo are the shop lights we clip onto the rafters for extra lighting. After 14 years we've gotten the details down pat! I accomplished a lot, but only have one finish to show, and even that may see the seam ripper before it meets its back. All it needed was the four cornerstones to make the border fit. Sounds simple enough, but I had to scrape the bottom of the box to make four checkerboard squares -- even had to bum four red squares from Nancy and use two gray squares from Holiday Frost. I'm not entirely happy with this one wonky corner, it's not square; so I may fix it ... or not. But it's done for now and it will make someone happy and keep them warm once it's quilted..
Next I worked on a spring wall hanging for my SIL's mountain cabin. I think the pattern name is "Come Fly with Me." I made it from memory after making one in 2014 as a Secret Santa swap gift. The geese represent the Blue Ridge Mountains and the flowers, well, spring flowers. I wasn't happy with using the back fabric for the binding as I had planned, so it's not finished. Next I added the black inner border to Holiday Frost. I wasn't completely in love with the red border I had purchased; maybe it was the brightness of the red, or the Valentiney hearts on it. I know, it's a minor detail for a quilt that will be used only a month out of the year, but since we were planning to hit a new quilt shop on the way home, I thought I'd see if I could find a better match. No luck there, but at home I found enough of the red I used in the HSTs to make the border! That will go on at the next retreat, if not sooner. I spent the rest of Monday fiddling with a table topper that had Y-seams. Could have been the late hour (or that extra glass of wine), but I wasn't in the mood to finish it. Tuesday and Wednesday were devoted to churn dashes, or monkey wrenches, whatever you want to call them. The pattern is called "Double Wrench" from the book 101 Fabulous Rotary-Cut Quilts by Judy Hopkins and Nancy Martin. My plan several years ago was to make a pair of twins to go on the guest room beds. Over time I had cut and begun construction on a duplicate set of blocks, but the project languished in the box. I had failed to inventory the box before I left home and discovered too late that I didn't have any white-on-white to cut the last six pairs OR the setting triangles. I decided one quilt was better than none so I stole some blocks from quilt 2 to go in the first quilt top. Who's going to know? Well, I guess you do, now ... The rows are assembled, but I had to wait till I got home for the side triangles. Thursday was devoted entirely to Geese Migration. I began laying out the blocks before everyone was up, auditioned sashing fabrics and began assembling the rows. (That's a light fixture in the upper right corner, not my thumb.) Things were going smoothly up until lunch time. After the break, I forgot that I was squaring up the blocks as I assembled them, so the longest row had to be unsewn. Final assembly will have to wait till the next opportunity. My annual Rock Island Retreat is now history, one "for the books," as they say. Check out other scrappy projects at Oh Scrap. In a few hours I'll be heading out to my annual retreat at Rock Island State Park in beautiful, isolated Quincy, TN! Even though the temps are still in single digits (4F at the park as I write this) and there is still snow on the ground, we had a lot of sunshine yesterday and I've been assured by the park staff that roads have been "clearing nicely." The challenge is going to be hauling a lot of my gear down our hill to where we parked my van as soon as the first flakes appeared Thursday night. I had the presence of mind to pack a lot Thursday afternoon, but I didn't want my machine or water or delicate foodstuffs sitting out in freezing temperatures. Fortunately, the machine is on wheels, the tool box is on wheels, and all the food and clothing can go in the wagon. All this to say I'll be out of touch for the week. But I'll be documenting my progress along the way so be prepared for a lengthy post when I get back on Friday. I'm going to try something new, taking the laptop to process pictures and write up each day's activity so that it should be easy to pull something together as soon as I get home. And just to show something quilty, this is what will be staying on my design wall at home. I realized I don't have enough of some of the fabrics to do an on-point setting; it would need the same number of blocks in each. With the more traditional setting I can use the shorter runs in the corners. It's Rainbow Scrap Challenge time again! And Angela at soscrappy is once again hosting this fun way to eliminate some scraps from our quilting activities. The color for January is PURPLE. (I think that must be Angela's favorite color because we had two purple months last year!) So you'd think I would be running out of purple fragments by now. NOT! Last year I used the Rainbow Scrap Challenge colors to pull out a UFO to complete for my One Monthly Goal. That turned out to be a pretty successful approach as I was able to complete seven tops, with another soon to be finished. This year I want to make a bigger dent in my scraps. Diann at Little Penguin Quilts has inspired me to make Scrap Jar Stars, a pattern she picked up from Gigi's Thimble. I've made three already with scraps leftover from the Bonnie Hunter mystery, En Provence. If I make 3 of these 12" blocks every month, I'll have a nice size quilt by the end of the year! 2-1/2" by 4-1/2" rectangles. I started cutting them down to 2-1/2" squares for the 4-patches (my units are bigger than Bonnie's, a story for another day), but that seemed wasteful, leaving me with odd 2-1/2" x 2" chunks. So, inspired by a quilt I saw on another blog, I decided to make 2-log rail fences and do a zig-zag pattern. Do you remember Zagnut candy bars? They were one of my favorites, but hard to find. Anyway, now I'm torn on a setting. Maybe you can help me decide. My first attempt is fairly traditional and certainly the easiest as it will go together in straight rows. But if I put them on point, I think it gives a more modern look. The only problem I see with this option, other than having to stand on my side when I sew, is I might be short of background to do any setting triangles that might be required. I'd have to work that out. What do you think? While you're thinking, pop over to soscrappy to see some fabulous finishes from 2016 and some great plans for 2017. Oh, it feels so weird to type 2017! Yet the new year is here, and a new month, so it's time to declare my One Monthly Goal (OMG) for January. It's pretty lame, actually, but my goal for January is to tie up loose ends from the last couple of months, things that kind of fell by the wayside with the activity of finishing Christmas gifts. Specifically, I need to add borders to Checkers, Anyone? I discovered that my border fabric is only long enough to go on each side of the center, so I need to create some cornerstones to make it work. Simple to do; just need time. Next up will be borders for Holiday Frost. I have the border fabric; I was just trying to make a decision about an inner border. I have settled on black, so now the top is ready to be finished. Another project that I thought about in November, but never got past the thinking stage, is Trellis Garden. I want to extend the blocks into the border. I have worked out what pieces I need to cut. Now it's just a matter of doing it! I'll be heading out to my annual retreat at Rock Island State Park on Sunday and these three projects will be first on my list to work on. Linking up with Patty D at Elm Street Quilts for OMG. There's something about beginning a new year. All counters are moved back to zero; it's an opportunity for a fresh start in everything. It's time to set new goals. Keeping in mind that I want to spend more time with my spouse, not only having fun, but working on projects around the house to get it ready to sell -- well, that could be fun, too -- and potentially moving before year's end, I have settled on some modest quilting goals for the new year. I'll expound on each of these goals over the next few days. But for now let's see how I'm doing. Remember that mystery, the one I'm NOT doing? Bonnie Hunter made the big reveal on New Year's Day so I threw together a few units for some of the clues I haven't worked on just to see if I would like it. I'm still not happy with the purple 4-patches but I think I can live with them. I'm running out of variety in the dark purples so I may decide to use just one for the HSTs. I have cut different yellow squares for each block, but will use the same yellow in the quarter-squares. So it's a GO. I guess I'm doing the mystery, after all. I'll join the linky party today to announce my intentions. On another front, Angela at soscrappy announced the first color for Rainbow Scrap Challenge 2017 -- PURPLE! My first thought ... well, I'll spare the expletives ... but my next thought was, "Yay, I can move some of these purple scraps off my cutting table!" Diann at Little Penguin Quilts turned me on to these fun stars and I've decided I'll make some each month with the RSC17 color. You can find a free tutorial for these 12" blocks here. Sew that's what's on my design wall this, the first Monday of the New Year. I'll be linking up with Judy at Patchwork Times also.